Potential stairlifts buyers are sometimes concerned that stairlifts are considered for disabled or handicapped persons. They rightly don't want to be labeled as such. The reality is that the modern quality stairlift is a slick, attractive, unobtrusive and assistive device that in most cases changes the users life for the better. Often giving back independence, dignity and freedom to enjoy life in spite of injury, illness and the normal processes of growing older. An electric stairlift, new, used or rental can quickly be installed into your home for a fraction of the cost and upset of moving to a single level home. Regain your independence with a safe, reliable, customized and attractive Florida Stairlifts solution to your stair climbing needs. We hope you enjoy the videos showing just what is possible. A common issue is that installing a stairlift on your staircase will block your doorway or intrude into a walkway at the bottom of the stairs. Some companies will stop the track short and let you struggle to get on and off the stairlift. The proper and best solution is a "powered" folding hinged rail or track. If your staircase has turns and you need to travel from top to bottom in one device then a curving stairlift is required. This video shows a stair lift in Tampa FL where the staircase had three individual flights and passed through a door mid way. The lift installation took a little over four hours and allowed the home owners mother to move in and move around the house just like any other family member. The beeping as the stairlift travels is optional and is intended to alert visually impaired stair users that the stairlift is moving. All modern stairlits are battery powered to give a smooth start and stop along with reliability even in the event of a power outage. By the same token all modern stairlifts have a swivel seat that allows you to safely use the seat without the risk of falling down the stairs. Most manufacturers limit the swiveling feature to top or upper level turning only. This prevents the dangerous possibility of swiveling over the open staircase which presents a serious hazard. The other advantage of a top or upper level only swivel is that the rail and chair can be positioned closer to the wall due to the geometry of the swiveling action. 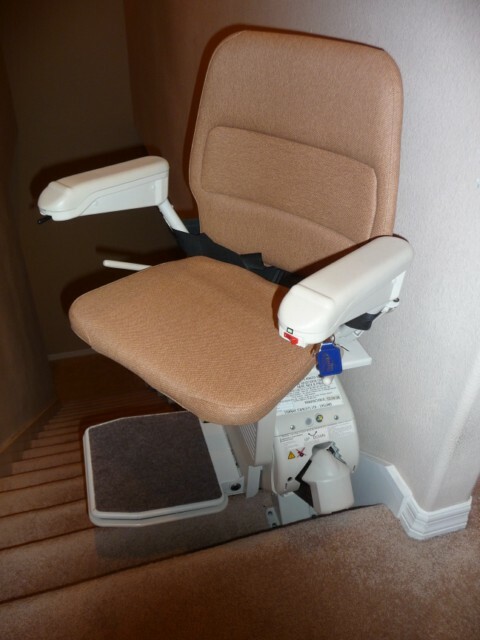 As an option you can request a "powered" swivel seat that automatically turns you as soon as you arrive at the top of the stairs to make getting on and off so much easier. 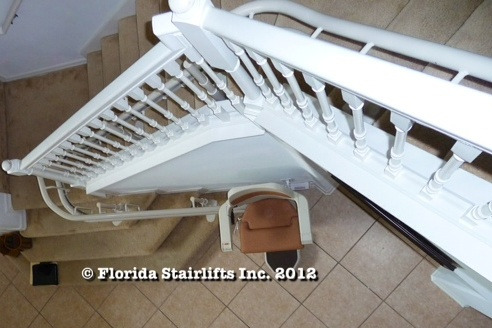 Florida Stairlifts Inc. is careful to only use and offer stairlift products that are absolutely safe and reliable. Unfortunately there are many products available on the internet that are just substandard, lack important safety features and lead to customer stairlift complaints. Stairlifts offered for self installation or made from a "kit of parts", utilizing old technology such as cable driven stairlifts are the main culprits and should be avoided. 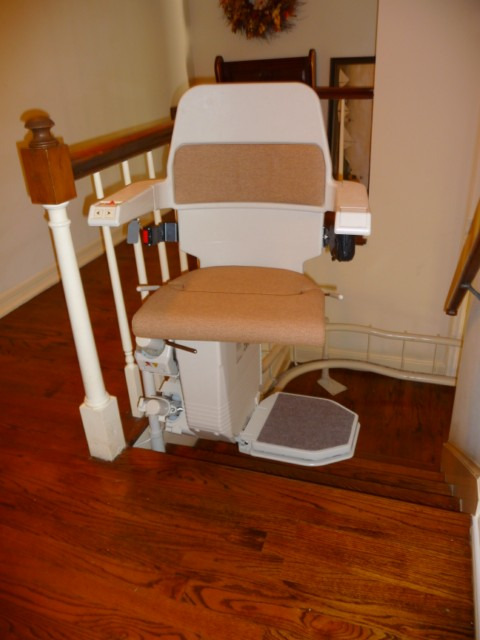 You are most likely only buying a stairlift once but will use it multiple times a day for years to come. Have your lift professionally installed by an expert that will be available to help and service your stairlift when required. I hope you found these videos useful and informative. Florida Stairlifts Inc. is an independent stair lift supplier and you can choose the stair lift make and model most suited to your needs and situation. Call us at 1 (888) 605 0174 for expert advice and caring service.